There are new discoveries to be made every time we go for a snorkel or SCUBA dive. These don’t have to be news-worthy discoveries such as finding a new and previously undescribed species. Personal discoveries can be just as exciting: whether it’s ticking off a new species on your list of ‘must see animals’ or observing a new behaviour, there are so many things to discover. During my time as a lionfish scientist in Honduras this summer it was new animal behaviours that excited and surprised me. Some of these surprises happened at the aptly named ‘Sorpresa’- Spanish for surprise. This story comes from a site called Rotunda, on the Banco Capiro reef system at Opwall’s Tela marine site. The reefs of Banco Capiro are special because of their extremely high hard coral cover relative to other Caribbean reefs. Banco Capiro is a good location for my lionfish research because these invasive fish are only culled during the Opwall season, meaning they reach much higher densities here than on regularly culled reefs such as those in Utila. I’ve had lots of exciting dives at Banco Capiro including my record lionfish culling dive and seeing both a nurse shark and turtle on the same dive! A lobster demonstrates ‘whipping’ behaviour as a diver swims overhead. It was an ordinary lionfish culling dive so I was swimming along the reef wall looking for lionfish. I spotted one and alerted my buddies before starting to swim towards it. As I got closer I noticed a spiny lobster nearby occupying a small shelter on the reef. The lobster emerged from its shelter and started walking towards the lionfish, so I decided to wait and see what was going to happen next. I was surprised to see the lobster boldly walk up to the lionfish and hit it on the flank with one of its antennae! I think the lionfish was surprised too because it suddenly darted away. I wanted to stay and watch for longer to see if the lionfish moved closer again, but sadly we were running out of time and needed to get back to the boat. This behaviour interested me because I am studying lionfish habitat preference and so I wondered whether lionfish compete with lobsters for access to shelters. I started doing some googling to see if this behaviour had been observed before. It turns out there has already been some research into lionfish and lobsters displacing one another from shelters! A study in the Bahamas placed a single shelter in a tank with a lionfish and lobster, then filmed their behaviour1. They recorded some behaviours just like the one I had seen on the reef (see previous reference for video)! 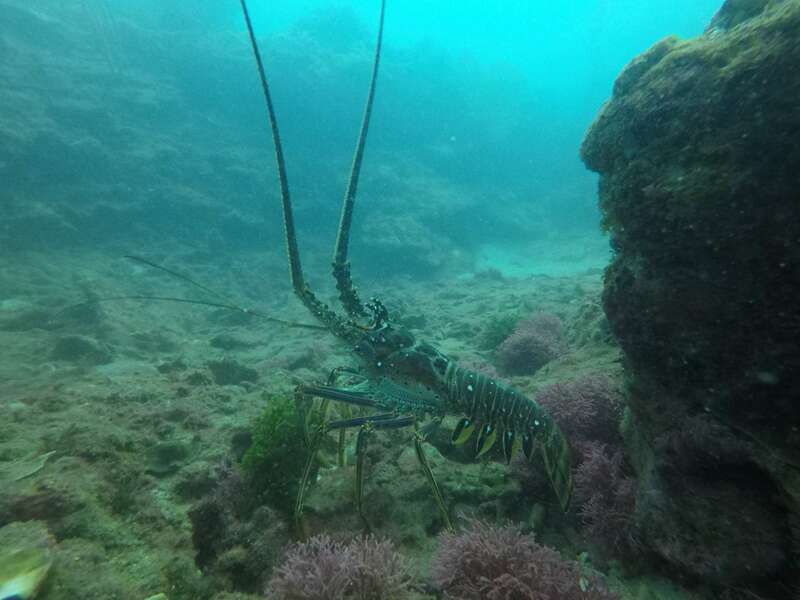 They found that lobsters spent more time roaming when lionfish were present, suggesting that lionfish displace lobsters from their shelters2.However, all conflicts were initiated by the lobster, just as I observed on the reef! After a bit more searching I found out that lobsters perform this same behaviour, termed ‘whipping’, towards predators such as triggerfish and it’s thought that whipping can be used to deflect an attack3. 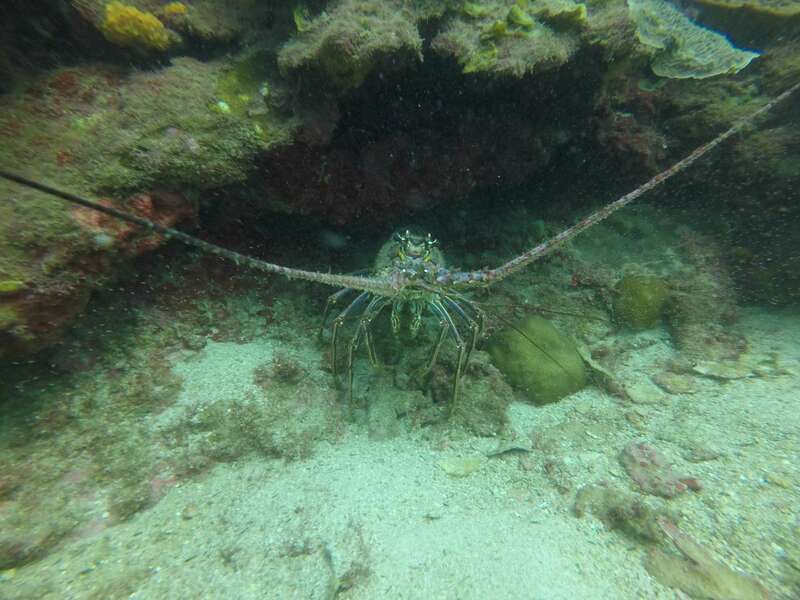 The Caribbean spiny lobster (Panulirus argus) in a typical reef shelter. I also found a paper on competition for shelter between lionfish and Nassau groupers4. Unlike the lobster study, this paper didn’t observe any aggressive interactions, but it did suggest that groupers avoid lionfish. The study was a similar set-up to the lobster one with a single shelter present for the two species to compete for. The authors found that groupers avoided the shelter if a lionfish was using it, but they used the shelter when the lionfish wasn’t using it. Reading about these habitat competition studies has made me wonder what other species lionfish may displace from shelters, or conversely what other species may displace lionfish. Investigating shelter competition is a really important aspect of studying the effects of lionfish on the reef. 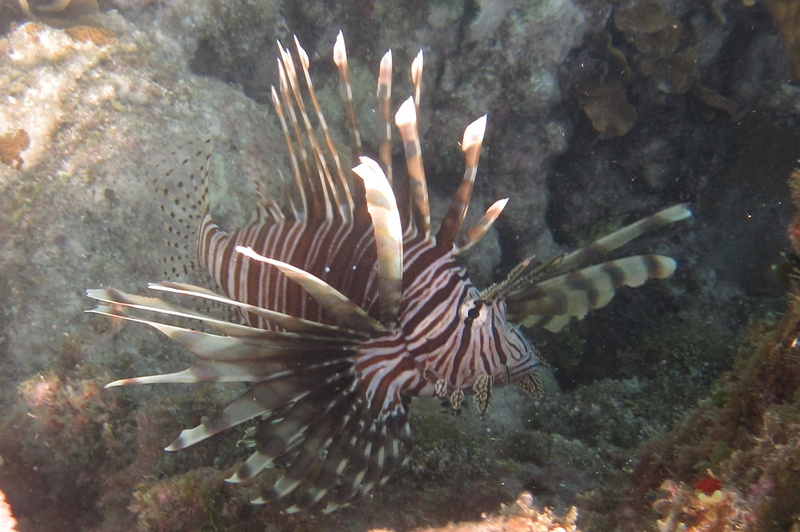 The effects of lionfish predation on reef fish abundance are well known but there is little research into the non-predatory effects they may exert. If lionfish displace other species, such as juvenile fish or lobsters, then those individuals may become more vulnerable to predation because they lack the protection of a shelter. Conversely, if other species displace lionfish then the lionfish may lose access to good hunting areas or become more vulnerable to culling by divers. I’m planning to study shelter competition between lionfish and native species in more detail next summer, so watch this space to see what I find out! The invasive lionfish (Pterois volitans). I hope you’ve found this article interesting and it encourages you to think and question the things you see on your next snorkel or SCUBA dive. I started off with an observation of a lionfish and lobster but when I did some research I ended up learning about lobster anti-predator behaviour, lionfish-lobster conflicts and shelter competition between lionfish and other species! Asking questions has taught me new and exciting things and has even opened up a whole new area of research for next year’s field season! 2Curtis-Quick J. et al. Interactions between the Caribbean spiny lobster, Panulirus argus, and invasive lionfish, Pterois volitans: Who displaces whom. Proc Gulf and Caribb Fish Inst, 2014. 199-200. Journal of Marine and Freshwater Research, 43, 15-28.